Milestones are a time for celebration. BMW gave thanks to its fans when it crossed 1/2 million fans. Audi recently celebrated its reaching 2 million fans and Mercedes Benz also showed some appreciation when it hit 2 million fans. All of these prior celebrations involved a wall post and video, but none of the automotive companies have done anything truly creative to celebrate such a milestone until now. Porsche passed the 1 million fan mark a couple weeks ago and as part of the celebration they are placing a special model Porsche in the Porsche Museum in Stuttgart. 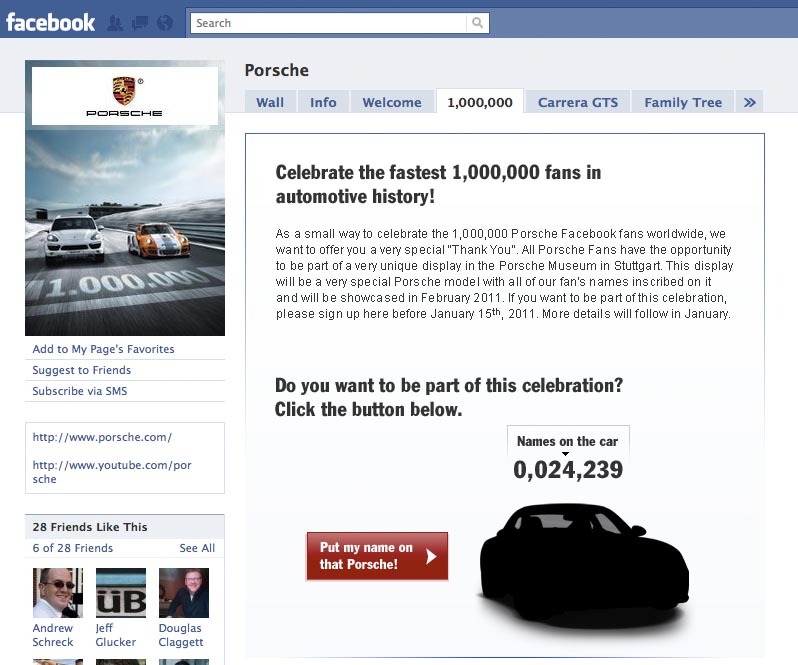 Fans can ask for their name to be on the displayed vehicle by signing up on their Facebook fan page tab called "1,000,000". It's a creative way to bring the milestone to life, much more interesting than some thrown together ad agency video. Major milestones aside, GMC blew everyone away with the most significant monthly fan gain - a whopping 95%. 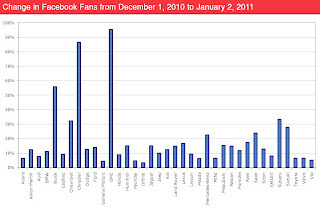 Like most double-digit changes, GMC's rise is attributable to media spend driving fans to their Facebook page. GMC has a sponsorship with the NFL that has fans voting for the "Never Say Never Moment of the Week." There are weekly prizes, a trip to the Super Bowl and a chance to win a 2011 GMC Sierra Denali. Hyundai ran some reachblocks in the beginning of December. Other companies that did some marketing in Facebook were Lexus, Chrysler, and Dodge (this is not a comprehensive list just some of the ads I personally saw.) Mercedes-Benz worked to promote their Tweet Race. The ad units sent people to the recently created Mercedes-Benz USA Facebook fan page. A final insight in December comes from Mazda. I find it interesting how some brands promote sales events (Acura has one right now), or they keep a corporate logo, or others promote a new product as part of Facebook's profile image. Mazda is promoting their new Mazda5 but they also found a nice, clean way to promote their other social media brand destinations in the profile picture. The promotion of other channels and their dot.com site is effectively communicated. It's refreshing to see an automaker actively engaging their audience on the web. Porsche has definitely set the standard here. I hope that other OEM's will soon follow suit. 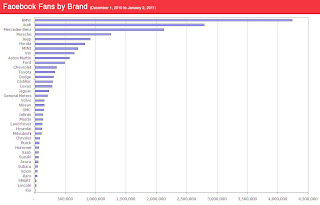 Social media is still evolving, so it will be interesting to see how businesses address their supporters once they reach high numbers like these car makers have. Thanks Melanie. Yes we are all in the early days of social media. Part of that is reflected in when you might honor your fan milestone. BMW did it at 1/2 million in early 2010, Audi and Mercedes did it at 2 million in late 2010, and now Porsche doing it at 1 million in December. 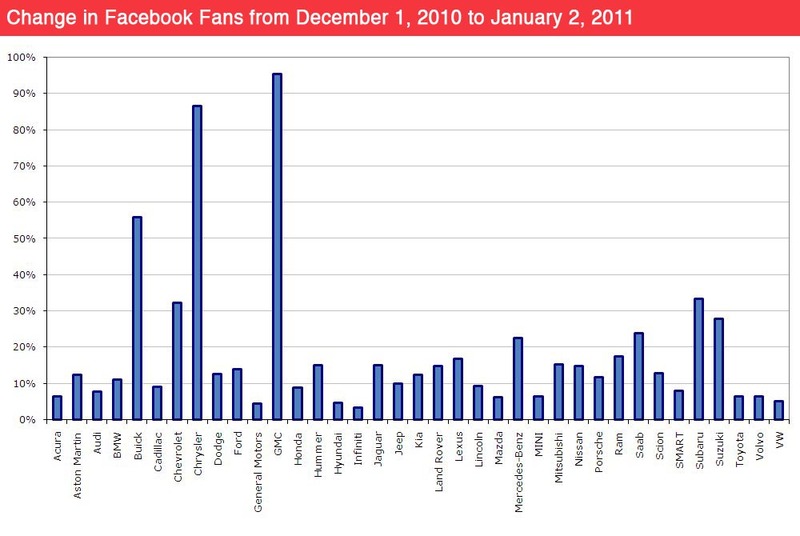 BMW's 1/2 million seems so quaint now; though, they are dominating with over 4 million fans of last month. Nice Chris. As usual. Did put you on my blog via blogroll. Thanks for research and data. Why cannot we see Peugeot and Citroën on this study?